LONDON (Reuters) - Hong Kong telecoms company HKT apologized after a Valentine's day deal it sent to HSBC staff offering discounted laptops "for him" but vacuum cleaners and kitchen appliances "for her" angered employees over its sexist implications. The multi-page advertisement, described as an "HSBC Staff Offer" was produced and sent to employees of the bank this week by HKT, a telecommunications company owned by Hong Kong conglomerate PCCW. HSBC staff in Hong Kong and London sharply criticized the offer, according to a source who shared images of it with Reuters, at a time when the bank is battling to reduce a gender pay disparity that is the worst among big British firms. "We have heard the feedback and offer our heartfelt apologies for any offense caused," a spokesman for HKT said on Friday. "We firmly believe in gender equality in both the workplace and in life, and we are committed to ensuring that we, and our business partners, exercise prudence, respect and inclusion for all." 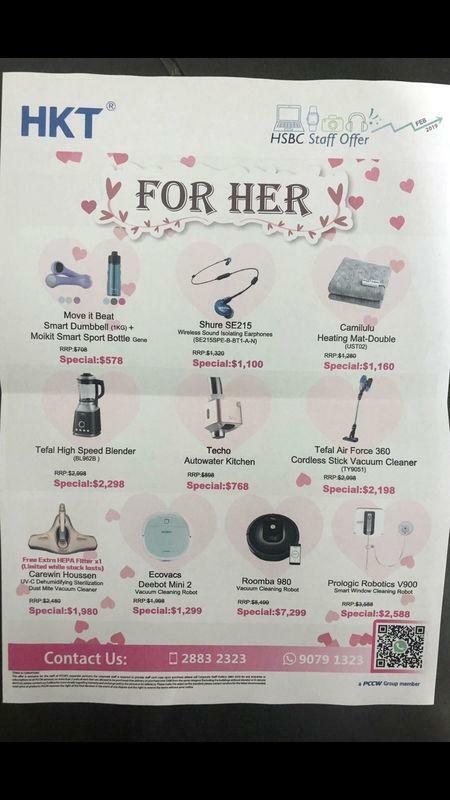 On pages festooned with pink heart drawings, the "FOR HIM" section offers discount laptop computers as well as a GoPro camera and wireless headphones, while the "FOR HER" gifts include five different vacuum cleaners, a blender and a kitchen water tap. "The offer is from a third party source who manage their own marketing materials. HSBC is committed to gender diversity in the workplace," a spokeswoman for HSBC told Reuters on Thursday. The controversy over the sexist implications of the advertising offer comes amid a widening debate about sexism and gender pay disparity in banking and industry generally. HSBC disclosed in December that its gender pay gap, which measures the difference between the average hourly salary of men and women, grew to 61 percent in the year to April 2018, up from 59 percent a year earlier. The lender - which employs more than 40,000 people in Britain - had the widest gender pay gap of any large British company in 2017. HSBC said the large gap was due to the fact there were fewer women in senior roles and more in junior ones, reflecting an industry-wide problem. The bank said it was taking steps to bridge the gap, including targeting an increase in the ratio of women in senior management roles to 30 percent by 2020, from 23 percent today.